Get your Independence Day on with this festive recipe for Amish Friendship Bread Fourth of July Bundt Cake. If you’re looking for a party centerpiece or something to bring to that Fourth of July barbecue, this is the recipe for you. Frost with Easy Vanilla Frosting and decorate with red, white, and blue sprinkles or jimmies, for a creative and colorful holiday celebration! Celebrate Independence Day in style! Frosting and sprinkles make this Amish Friendship Bread Fourth of July Bundt Cake a festive recipe for any social event. Dust the greased pan with a mixture of ½ cup sugar and ½ teaspoon cinnamon. Pour the batter evenly into Bundt pan and sprinkle the remaining sugar-cinnamon mixture on the top. Let cake cool for 10 minuets and then invert onto serving plate. Once cake is completely cool, frost with 7 Minute Icing. 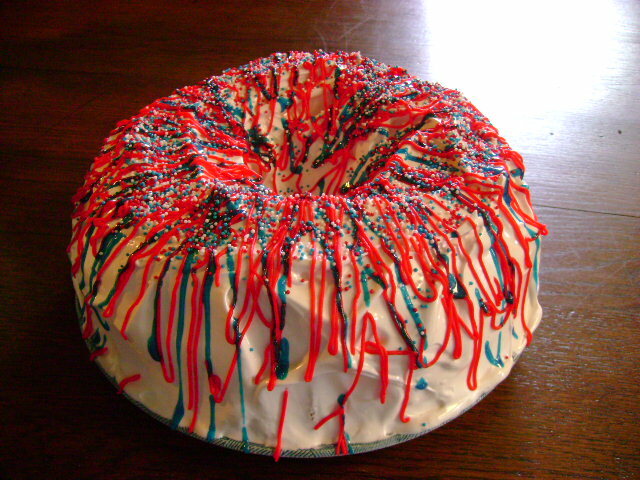 Top cake with red, white and blue sprinkles. What a pretty cake! We have made this recipe as a bread. Your cake looks so much prettier than the bread does.